I love to cook and eat healthy, homemade food. But with four kids and lots of other interests, I often fall back on frozen Trader Joe’s options or way-too-easy and less balanced choices (baguette with butter and salami for dinner, anyone?). Lately I’ve been working on strategies to make eating nourishing, delicious, from-scratch food a little easier and less time consuming. The first step is our weekly roasted chicken dinner. I buy a good sized free range organic chicken (they really do have a better flavor, not to mention being healthier and more humane), plus whatever root vegetables look good- I like fennel, turnips, parsnips etc. and of course carrots! Heat oven to 425. Line a small roasting pan with heavy weight aluminum foil. Chop one onion and root veggies into similar sized chunks, reserving any tops, fronds etc(you’ll see why later). Place chopped veg in lined pan, drizzle with oil and sprinkle with salt and pepper. Remove chicken from wrapping and discard any giblets(you can cook them later if you like, but I don’t care for them!). Pat very dry(skin won’t crisp up if it is damp). Salt and pepper chicken cavity, halve your second onion and place inside cavity with a few chopped stalks of celery. Nestle chicken among veg in roasting pan and salt and pepper generously. Leave in oven for 2 hours. 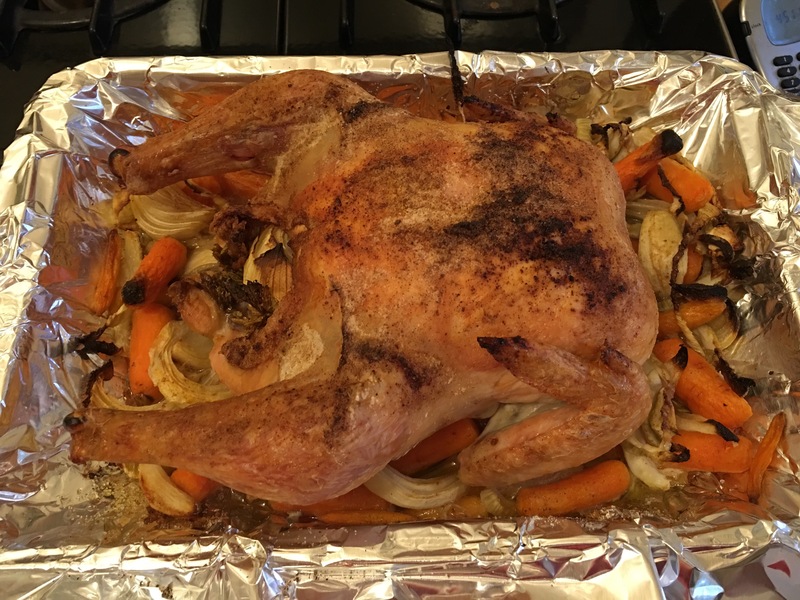 After 2 hours, remove from oven and place chicken on a cutting board with a well, or a rimmed platter(to catch juices), and allow to rest for 20 minutes. 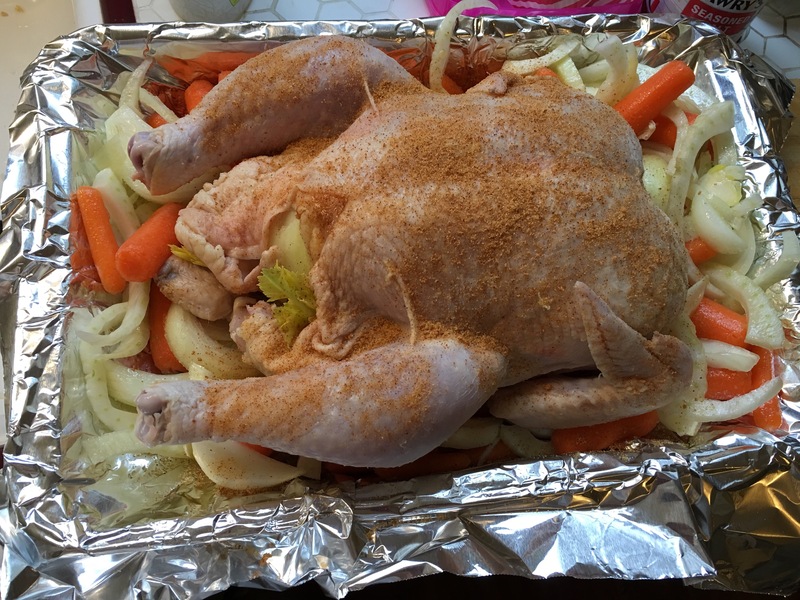 Meanwhile, reserve accumulated juices in roasting pan and put veggies back in oven to brown further while your chicken rests(if they look brown enough you can just cover with foil to keep warm). Carve up your chicken, and serve with veggies, and a green salad or rice. Pick the carcass clean of meat and set meat aside for a future meal(part 3 of this chicken series!). Separately save all the bones, and cleaned carcass with vegetables inside- tune in to part 2 for what’s next with those!